The work surveys a range of issues in decentralization: which actors in each country have been most responsible for initiating and sustaining decentralization; how much decentralization to regional and local authorities has transformed the state; and whether stronger local governments produce greater accountability to citizens. The final chapter by Tulchin and Selee draws conclusions on these issues based on the case studies, while the introduction by Philip Oxhorn lays a theoretical foundation for understanding the relationship between decentralization and democracy. This is a first-rate book. It consists of well-researched and well-written case studies that contain plenty of useful new information. The comparative sections of the text are quite solid and enlightening. 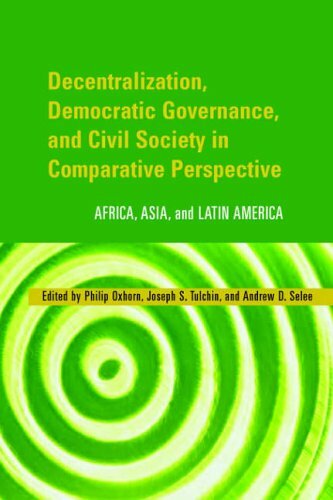 This volume examines the effects of decentralization on citizen-state relationships in the developing world. It deserves to be read and pondered. Provides important insights... will be of much interest to South Asian policy-makers and academics in the area of public administration.